While HostMonster isn’t the cheapest web hosting solution available, it is one of the best values. No other host in this price range offers the same levels of disk space and monthly bandwidth, along with unlimited e-mail accounts and support for unlimited domains. This means plenty of allowances for small sites that want to grow as well as big sites that need resources right now. HostMonster also provides one of the widest selections of free software and scripts; allowing you to start a blog, build your own e-commerce enabled website for small business, conduct polls and surveys, build a forum, and much more. We also found HostMonster customer service to be very reliable. During the set-up process for our video game blog, we called and were quickly connected to an intelligible, helpful representative – no long holding period or dealing with overseas call centers. This saves time and makes it easy to get questions resolved. HostMonster is an exceptional value and dependable company. Like many web hosts on the market today, it offers discounted pre-paid contracts in one, two and three year increments. While we'd prefer to pay on a month-to-month basis, the company’s long track record and strong value proposition still make it one of the top companies for most web hosting needs. There is no set-up fee and a free domain comes with any contract length. This means you have the ultimate flexibility to purchase a shorter contract and still get all the benefits of a longer-term agreement. Additionally, there are no cancellation fees with HostMonster so cancel anytime if you change your mind. Phone support and live chat are available 24/7. All phone support is based in the United States and wait times are usually 2 minutes or less. This means you get quick, quality service. There is also a responsive ticket system and a self-help knowledge center that contains close to 300 articles on various web hosting topics. This allows you to learn more about successfully managing a website. Many web hosts are now offering unlimited disk space. While no host can truly provide unlimited resources, HostMonster easily supports the average website that uses 20 megabytes or less (1 gigabyte = 1,024 megabytes). In addition to disk space, many web hosting companies are also offering unlimited bandwidth. Again, no web host can provide infinite bandwidth each month, but HostMonster easily supports the typical website that uses 10 gigabytes or less. Learn more about unlimited dusk space and bandwidth. "The combination of price, features and service along with an 15 year track record makes HostMonster tough to beat." HostMonster employs SSH or Secure Shell Access; this allows you to make changes to your site and development environment within a secure channel. HostMonster also provides SSL secure servers. SSL (Secure Socket Layer) ensures that any information exchanged between your visitors and the website is encrypted and safe. 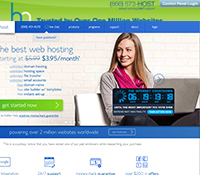 HostMonster uses the latest quad processor servers for good website speed and performance. It also counts on a variety of safeguards in its data centers such as backup generators and 24/7 network monitoring to keep your site online and accessible to visitors all the time. cPanel, one of the most popular and easy hosting control panels, is available with every HostMonster account. This program makes it really fast and easy to manage your website. As a bonus, the control panel layout can be customized to suit your preferences. Try the demo at HostMonster.com. Every new web hosting account receives a free domain and free set-up, regardless of contract length. In addition, each new customer also receives $100 in free credits for Google Adwords Search Marketing to help get more website traffic. All accounts come with a full 30 day money-back guarantee. If you are unhappy with the service for any reason, just ask for a full refund. As a HostMonster customer, the guarantee gave us the confidence to finalize our purchase. This is a company that stands behind its product. For a limited time, HostMonster has reduced its already low price of $6.95/month on 36 month plans to $6.49, so take advantage while you can.